As the pastor of an inner-city church in New York City, Timothy Keller has compiled a list of the most frequently voiced ???doubts??? sceptics bring to his church, as well as the most important reasons for faith. In THE REASON FOR GOD, he addresses each doubt and explains each reason. About "The Reason For God: Belief in An Age of Scepticism"
Customer Reviews For "The Reason For God: Belief in An Age of Scepticism"
I bought this book for my friend and she likes it. It is a very informative book. Adding this to the focus on add list collection is recommended. This book is exactly what you need. We all have questions or at least have people around us who raise questions about what we believe, well this book is a great resource. Not only is it easy to read but Timothy writes with such meat that you walk away from each chapter equipped. I could not recommend it more for anybody who is thinking through what they believe. A book I borrowed off my brother. I went on this blind date once. It was exciting and we got along like a house on fire. He was good-looking, a gentleman, intelligent. Then I find out he's just not into "the religion thing". We then went on to have hours of brilliant conversation. Although my faith is strong and my heart 100% for God, some of his questions stumped me. I didn't feel I always had well thought out and intelligent answers. I knew WHAT I believed. I knew my Bible and my Jesus but I didn't have all the WHY answers so articulate. It really got me thinking. I talked to my brother and he lent me 'The Reason For God'. I could not put it down. It was so well written and put together in a way that was clear and easy to read. The layout of each chapter is clear and simple. A chapter often stars with a question someone who doesn't have faith will often ask. "Aren't all religions the same? ", "If God is love why is there suffering?" But Timothy Keller gives a response that doesn't just dance around the answer or politely smile - he answers with the truth but not apologising for his faith but throwing the question back at the person with a directness that fits. He challenges Christian to doubt their doubts and search more of what they believe. Great book for those who are "sceptics" but also for anyone who is looking to brush up on their apologetics. Keller has a way to gently steer and guide discussion pointing to the truth of Christ crucified. 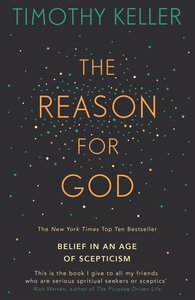 This book critically challenges the secular views and arguments against the "reason for God". Keller critically analyses and offer his personal arguments against several arguments against the belief in a "God". Some of the main arguments include discussions on whether the bible can be trusted when it has been written by personal accounts that may include biased information. Keller also challenges the views that is held by atheist writers and argues for a reason that a "God" may exist. This is a informative and well-written book that offers a well formed argument for the reasons for believing in God.